– N.J.S.A. 39:4-36 | brainsnorts inc.
New laws always bring question marks. Why is it necessary, and what brought this to mind? Why weren’t we smart enough to have thought of it before now? Was this a knee-jerk reaction, or was it thoroughly considered? Was there much opposition, and what were their reasons? What are the risks if we hold off and give it more thought and time? 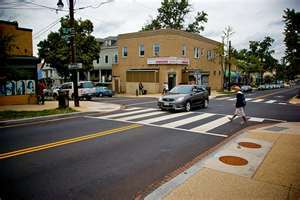 In April of 2010 a new law took effect which required New Jersey motorists to come to a complete stop if a pedestrian is in a designated crosswalk or face a minimum $100 fine and subsequent increases. Normally, I am in complete agreement with anything that favors people on foot versus people in cars, but not this time. Too many times I’ve been driving down a neighborhood street while followed too closely by another car. If I were to have to stop suddenly for a pedestrian who turned on a dime from walking up the sidewalk to crossing the street, it would have been very likely that the car close behind me would end up not only crushing my trunk but probably would have pushed my car through the crosswalk, maybe even through the pedestrian. I have already seen a car accident in which a car stopped for a pedestrian, but the following car did not notice the stoppage and crashed into the back of the stopped car. Luckily, nobody was hurt, but hey – it’s early yet. The right of way should be given – sometimes – to whoever has less control in a situation of conflict. 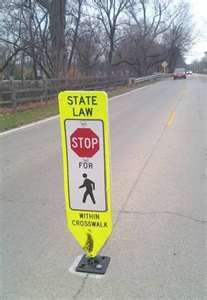 A pedestrian has greater control over his or her body when suddenly turning to cross the street. That pedestrian can more easily come to a complete stop than a two-ton vehicle doing 25 or 30 through the middle of town. Asking the car to suddenly jam on the brakes is asking for trouble. Asking the car to cut speed for the walker is asking for more pollution and more money spent on replacing tires, brakes, and gas. I’m not saying that a car should be able to plow down anyone in the middle of the street. I’m just saying that if someone is standing on a corner, they should remain standing until either the light changes in their favor or there are no more cars coming. I wish I could walk everywhere. I wish I could walk to work, at least. I spent one year of college without a car, taking either several buses and leaving 90 minutes before class when the weather was poor or riding a motorcycle when the weather was decent. In the name of global warming and carbon emissions, I wish we could all go back to riding horses or taking trains. But since we can’t, then we have an obligation to make decisions based on protecting the health safety of everyone. Yes, we want to encourage more people to walk instead of drive when it’s possible and reasonable. But we also want to encourage policies that do the most good for everyone involved. This law will ultimately do more damage than good. August 12, 2011 in car accidents, driving. psst – wanna know “the secret”? Amazingly enough, this morning we screeched to a halt for pedestrian who stepped into the crosswalk. He did so without looking to see if cars were coming, without hesitation, and without ever looking back to see what engines were ten feet away from him. Then he stopped to pick up a piece of plastic on the roadway, comfortable in the crosswalk across an on-ramp to Highway 99. He was obviously feeble in the survival department, but I was glad that we’ve been “trained” by the law to look out for the pedestrians. Next I would like a law passed that if you’re a stupid cow with a cell-phone, you’re not allowed behind the wheel of an SUV. is it a law in your state as it is in new jersey?